Each of the 10 chapters in the book explains a factor of fearlessness and begins by telling how 50 Cent learned this Fearless Philosophy in Southside Queens. 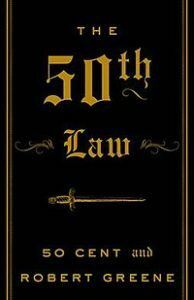 The 50th Law illustrates the laws of the book by supplementing anecdotes from 50 Cent's life with historical examples from Malcolm X, Miles Davis, Sun Tzu, François de La Rochefoucauld, Machiavelli, Richard Wright, James Baldwin, Thucydides, Dostoyevsky, Charlie Parker, and the Baron de Montesquieu. In the end, this is a book about a particular philosophy of life that can be summed up as follows—your fears are a kind of prison that confines you within a limited range of action. The less you fear, the more power you will have and the more fully you will live. It is our hope that The 50th Law will inspire you to discover this power for yourself. Understand: no one is born this way. It is unnatural to not feel fear. It is a process that requires challenges and tests. What separates those who go under and those who rise above adversity is the strength of their will and their hunger for power. Those who follow the 50th Law are not afraid of change or chaos; they embrace it by being as fluid as possible. They move with the flow of events and then gently channel them in the direction of their choice, exploiting the moment. Through their mindset, they convert a negative (unexpected events) into a positive (an opportunity). He decided to transform the hustler’s words into a kind of code that he would live by: he would trust no one; he would conceal his intentions, even from friends and partners; and no matter how high or low life brought him, he would remain the supreme realist, keeping his hustler’s eye sharp and focused. Understand: as an individual you cannot stop the tide of fantasy and escapism sweeping a culture. But you can stand as an individual bulwark to this trend and create power for yourself. His superiority, he realized, was that he knew that he knew nothing. This left his mind open to experiencing things as they are, the source of all knowledge. When you do not get to the root of a problem, you cannot solve it in any meaningful manner. People like to look at the surfaces, get all emotional and react, doing things that make them feel better in the short term but do nothing for them in the long term. As part of this approach, you must become a better observer of people. This cannot be done on the Internet. It must be honed in personal interactions. You are trying to read people, see through them as best you can. You come to understand, for instance, that a person who is too obviously friendly after too short a time is often up to no good. If they flatter you, it is generally out of envy. Behavior that stands out and seems excessive is a sign. Don’t get caught up in people’s grand gestures, in the public face they put on. Pay more attention to the details, to the little things they reveal in their day-to-day lives.